Ian’s Friends Band also known as the IFF Band (Ian’s Friends Foundation Band) is a teen rock band from Roswell, Ga. 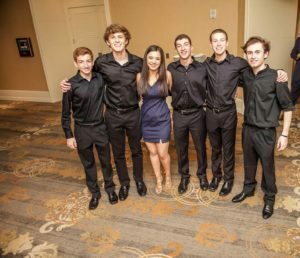 They are a group of passionate, dedicated kids that perform at numerous events in Atlanta to raise awareness and funds to find a cure for pediatric brain tumors. This is a cause that is very dear to each of them, Ian’s Friends Foundation. The band formed in November 2014 after performing together for the 1st time for 600 people at the 7th Annual Ian’s Friends Foundation Evening of Inspiration at the Loews Atlanta Hotel. A group of talented, passionate teens who perform as IFF’s band around ATL to raise awareness & funds to find a cure for pediatric brain tumors.